It was her birthday and she could hardly wait. Roarie the Darigan Grarrl- real name Roarbgcrawr, but most pets and Neopians can't pronounce it- hadn't slept at all the night before. She should have felt tired and was sure that on any normal day, she would have. But that day wasn't just any normal day. That day was her first birthday with her adoptive family. As she'd lain in bed the night before tossing and turning, her mind kept going back to the same thoughts. Would there be cake? Would there be ice cream? What kind of presents would she unwrap? The thought of the presents kept her up the most. Roarie had been asking for a petpet for quite some time. All her siblings had one, and she felt she was ready for one, as well. She knew a petpet was a big responsibility, but she felt as ready as she'd ever been. She didn't even care what kind of petpet it was. She would have been just as happy to receive a Spardel as she would have if she received a Snowbunny. Having not slept at all, Roarie was out of bed before her owner and any of her siblings. It was hard to resist tiptoeing into the living room to take a peek. Just as she'd thought they would be, the presents were stacked neatly by the couch, just waiting for her to open them. But a petpet wouldn't be wrapped up in a box. He'd need to breathe somehow, right? She almost gave up hope on the idea of a petpet until she saw the present in the corner. It wasn't wrapped up and it wasn't in a box. A small, blue blanket was tossed over it and there was a small noise coming from inside. Was that it? Was that the petpet she'd been wanting? The temptation to pull that blanket up and toss it aside was almost unbearable. She couldn't stop thinking of the possibilities. Maybe it would be a Snowbunny that would go skiing with her in Terror Mountain, or a Spardel that would explore the Haunted Woods with her and be just as afraid when a ghost walked past, or maybe a Meepit that would bake cookies with her during the day and terrify her siblings at night. The excitement was getting to her, the possibilities were endless. She was certain that the only way she would have been disappointed was if it were a rock. (Not that she had anything against petpet rocks, they just weren't exactly what she wanted.) Luckily, she didn't have to wait that long to find out. Before she could even contemplate peeking, Kerslie was behind her, a large, friendly smile on her face. Kerslie joined the family after Roarie and had been adopted, too. She hadn't been with them that long, but an outsider wouldn't be able to tell. She'd fit in the instant she'd been brought home, and that was how their owner knew she was going to stay. Though she'd been a Shoyru when adopted, she was now a Faerie Xweetok. "Good morning, Roarie!" she sang happily, frolicing to the couch to sit down beside the presents. Her other two siblings followed right behind her. "Good morning," her brother, the Darigan Lupe, mumbled before tossing himself onto the floor. "Morning!" her other sister, a Darigan Cybunny, chimed, hopping forward to join Kerslie's side. The three being in that room with her only made her excitement greater. Then, another voice spoke, saying "Good morning," just as the others had. Roarie spun around to face her owner. Like her brother, her owner wasn't much of a morning person, either, but he still wore a smile. He was just as excited about her opening her presents as she was. "Which do you want first, presents or cake?" Roarie didn't skip a beat. She jumped in excitement, tooth bearing grin spreading her face. "Presents!" she shouted. Her owner laughed in amusement before saying, "Okay, pick one." Without giving the others much thought, the Grarrl ran toward the one with the blue blanket tossed over it, pulled the blanket off, tossed it aside, and stared down at what had been underneath. An altachuck stared up at her curiously from its cage, its eyes wide, its nose slightly twitching. Roarie was quiet a moment and the silence was making her owner nervous. He wasn't sure if she'd like the petpet. He hadn't been sure when he picked it out, and he was even less sure now. In those seconds that passed, she didn't seem to have a reaction at all. Kerslie pulled her ears down against her head. "She doesn't like it," she said sadly. "I don't think she likes it." Her owner took a few steps toward her, speaking along the way. "I wanted to get you something else. An Angelpuss, maybe. Or a Snowbunny. But we were on a budget. I picked it out right after you came down with the Neoblues. Spent all the Neopoints we'd saved up on the cure. I can take it back and get something else if you want?" Before he could say anything more, a smile spread across Roarie's face. She opened the cage and gently picked the Altachuck up, staring into his wide eyes. "No," she said. "He's fine." "What are you going to name him?" Kerslie asked, ears standing up once more, a smile spreading her face again. Roarie frowned. She wasn't sure what to name him. She'd thought about all the things she'd do if she had a petpet, all the places they'd go, all the cookies they'd bake, but she hadn't once thought of a name. "I don't know," she admitted. "I haven't really thought about it." "Well," her brother said, standing up and stretching, "you have all day to think about it. Frankly, I think you should name him Cobain_92. Since I'm your most awesome sibling and all. Of course, any variation on that name would work. But for now, can we please eat cake? I'm famished." They all laughed except her brother. He kept a serious face the entire time. When the laughter subsided, he blinked and said "I was being serious." About which part, they weren't completely sure. Roarie hugged her petpet, not wanting to put it down, and said, "Let's go eat cake! Then, I'll open the rest of my presents." They all stood in the living room once more, their stomachs full of chocolate cake and vanilla ice cream, and Roarie's attention set on the presents again. The unnamed altachuck slept silently in the petpet bed just outside the living room entrance. He was thrilled to be in a new place, with a new owner. He could remember being in a shop not long ago. So many Neopets came to look at him, but most passed right on by. They wanted cute petpets, they wanted expensive petpets. He wasn't what any of them were looking for. He'd been so happy when the Neopian and his Xweetok bought him. He thought he'd have to wait forever to have an owner, but finally, he had one. His sleep was interrupted by his owners voice. He already recognized it, even though it had only been two hours. He couldn't speak, but being in a shop around Neopets and their owners all day, he'd learned to understand the words. He hadn't had much else to do during those months spent there, after all. He lifted his head up as the words hit him. "I'm not sure if it's right," she said sadly, "I wanted it, but I don't think it fits. Do you think you could take it back and get me another one?" Kerslie said something, too, but the petpet didn't hear what she said. By then, he was already walking away, head held down, eyes tearing. He'd been so happy to have a home, but she didn't want an Altachuck, either. He was too common a petpet. Everyone had many just like him. And they were always doomed to sitting in safety deposit boxes. She'd take him back and get something cute. Maybe she'd get a Babaa. There had been one in the shop beside him for a day. It had only been there one day, and it was gone. The Altachuck had already been in there for two months. Sighing, he sat down in front of the door. He wouldn't leave, he was sure there was a way to fix the problem. He was so close to having a home, and he wasn't going to give up. He vaguely remembered a Neopian entering the shop asking for a lab petpet. From what he could piece together, the lab could change a petpet. That was his key. If he could change himself into a species that Roarie would like, he would have a home! Feeling encouraged once more, the petpet curled up and fell asleep again. He was up before Roarie. He was just as excited as she had been the day before. 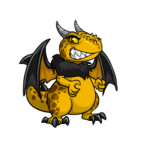 What kind of petpet would he become? Would he become a Meepit? Or a Feepit? Or a Babaa? As quietly as he could, the altachuck tiptoed out of his petpet bed and crawled across the floor of his owners room. Much to his surprise, she'd installed a petpet door for him, making sneaking out easier than he'd thought it would be. The house was silent, as far as he could have guessed, everyone was still asleep. The sun was only just rising outside and the house still had a dark feeling to it. The scene was far too perfect. He would sneak to the petpet lab, become a different petpet, and sneak back. Roarie wouldn't know until she woke up to find him sound asleep in his petpet bed. Just as he'd planned, he moved quietly across the house, and quietly down the stairs. When he saw the petpet lab map right beside the door, he realized just how perfect this situation was turning out to be. The window above the couch was open, and jumping out of it was easy. He made a quick leap, landing in the grass and not even getting so much as a scratch. The lab wasn't too far away now. Being just a petpet, he wasn't great at reading maps, but he was great at following his nose, and he reached the lab in a matter of minutes. As he stood behind a strange looking Scorchio, he spotted the tiny hole in the wall. That was it; it had to be. It was the only place in the room that only a petpet could get to. Kerslie stood in front of him, her Quadrapus beside her. He'd made it this far, though, and he wasn't going to let the Xweetok stop him. Without looking back, he bolted for the hole in the wall. Kerslie spotted him almost instantly. Though there were many Altachucks in Neopia, she knew instinctively which one that was. "Wait!!! That's dangerous!!!" She ran for the petpet, but it had already crawled through the wall before she could catch it. "Oh no," she muttered, "oh no, oh no, oh no. If he disappears... if he vanishes... Roarie will be so upset... oh no." The petpet didn't hear any of her words as he stood in front of the crazy Kookith. Suddenly, he felt terrified. The ray was pointing at him and he was afraid. For a passing moment, he had the urge to run and leave, but he'd made it that far and he was determined to see it through. Before he could even think about fleeing, the ray was fired at him. He closed his eyes tightly, knees trembling as he did so. When he opened them, it was over. The Kookith was shooing him away and it was done. He stood there for a moment, still shaking. The Kookith seemed intent on pushing him out the door and when he did, Kerslie was in front of him, eyes wide, jaw dropped. He was certain he'd been turned into something hideous. Now, Roarie definitely wouldn't want him. He could feel his eyes tearing up again until Kerslie spoke. "Oh my, it... it worked. You're a Snowbunny now! A strawberry Snowbunny! You were cute before but now... you're adorable now." She paused, as if thinking, and then a look of realization spread her face, as if a light bulb had been turned on within her head. "You overheard us, didn't you?" The petpet nodded, whimpering silently. "You mean, you can understand us?" "None of our other petpets can. You are one odd petpet. That's not a bad thing, though. But you should know, Roarie wasn't talking about you. She was happy to have you. You didn't have to come here to change your species. You could've been turned to soot... or... or... or worse! You could have vanished! Come on, I'll take you home. I'll show you that Roarie cares." Kerslie lifted the Snowbunny up and left, her own petpet following close behind. The walk was silent, she didn't say a word as she made her way to the house. She remained just as quiet as she pushed the door open. Roarbgcrawr was moving frantically across the house, tossing everything aside that was in her way. "Where is he?" she shouted. "Where is he?" Finally, Kerslie spoke. "Roarie, we've had a misunderstanding. When you were saying the dress I got you didn't fit and that you'd like to return it, your Altachuck thought you were talking about him. So, he went to the petpet lab and..." she looked down at the Snowbunny she held. Roarie ran toward her sister and grabbed the petpet from her arms. "You found him! Thank you, Kerslie! He... he thought I didn't want him?" she asked, hugging her pet. Kerslie nodded, Roarie looked at her Snowbunny. "I wasn't talking about you," she assured him. "I was happy to get you. I wouldn't return you. You were perfect just the way you were." His expression dropped for a moment and she knew why. He thought she was saying that he wasn't perfect any more. Quickly, she added, "And you're still perfect now. But I would have been just as happy if you hadn't gone to the lab and become a Snowbunny." Kerslie smiled. "Have you thought of a name?" she asked. Roarie nodded. "I just did. From now on, I'm going to call you Berrie," she said to her new friend. Kerslie gave them both a friendly smile and Roarie hugged Berrie once more. She had her petpet and she couldn't have been happier. "No more going to the lab, though," she instructed. "Don't scare me like that ever again." "Why don't we bake some cookies?" Kerslie asked. Berrie seemed thrilled at the idea. He hopped out of Roarie's arms and began the trip to the kitchen by himself. Roarie grinned, heading toward the kitchen behind him and saying, "We'd love to." Note: Petpet lab results may vary. Not all petpets are as lucky as Berrie. Crazy Kookiths shouldn't be trusted. Use with caution. An imposter inside an imposter... we need to go deeper.